Planning a pizza party? This fun appetizer deconstructs a delicious white pizza pie and transforms into a baked dip that's perfect for laid-back snacking with family and friends. Serve with garlic knots, crostini, or your favorite kind of chip! Line a baking sheet with foil for the tomatoes. Drizzle the olive oil on top and salt. Roast for 20-25 minutes until they burst open. Set aside. In an oven-safe baking dish (4x6 works) combine the softened cream cheese with most of the provolone, mozzarella and parmesan. Set aside a small bit of all 3 cheeses for topping. 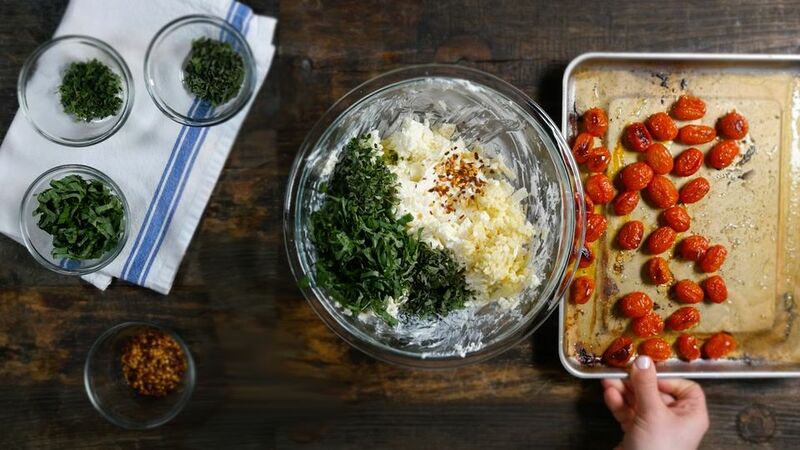 Stir in the herbs, garlic and roasted tomatoes, and mix well. Clean the edges of the baking dish if it got messy when mixing and top with the remaining cheeses and bake for 25 minutes or until top is golden brown and cheese is bubbly. Serve immediately!